At last, the spring veggies have sprung! Local Farmers’ Markets are starting to pop up, and the weather is dry and balmy. Springtime veggies like chard, kale, spinach, cauliflower, broccolini, and tiny new carrots are on the menu, as well as winter relics like beets, oranges, and lemons. Plus the quintessential springtime veg: peas. 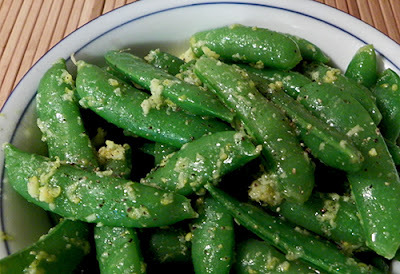 Snap peas, also known as Chinese pea pods, are young peas that are small and tender enough to eat pod and all. Get ‘em now, because as the peas mature, the pods toughen and can’t be eaten. This recipe can be varied in a number of ways. 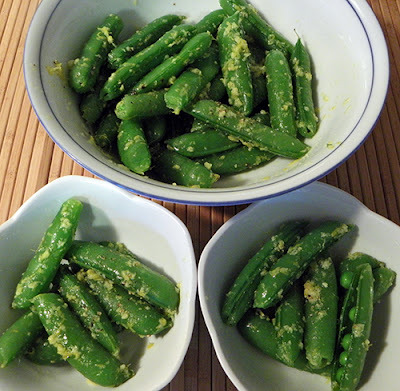 Snow peas can be used in place of snap peas. Orange rind was used in the original recipe instead of Meyer lemon. Try sesame or walnut oil in place of olive oil, or add a small splash of toasted sesame oil. Vary the amount of ginger or lemon, or use both lemon and orange. Experiment with replacing the ginger with fresh garden herbs like a sprinkling of thyme or marjoram. Alter the amounts of vinegar or oil. Eat ‘em hot, cool, or chilled. The possibilities are endless for this lightly cooked and dressed treat. Wash the peas. 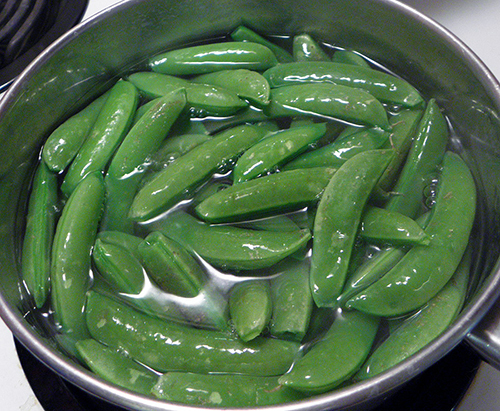 Cut off the stem ends of snap peas with a small knife, lifting up to remove the strings along the shorter edge of the pea. Set aside. Bring a pot of salted water (about 1 tsp. to a gallon, or your preference) to a boil. Meanwhile, make dressing: place citrus zest and ginger in a small bowl. Stir in vinegar. Stir in oil. Set aside. 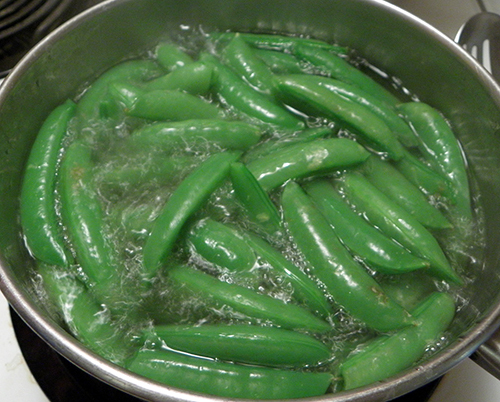 Add snap peas to boiling water and set timer immediately. 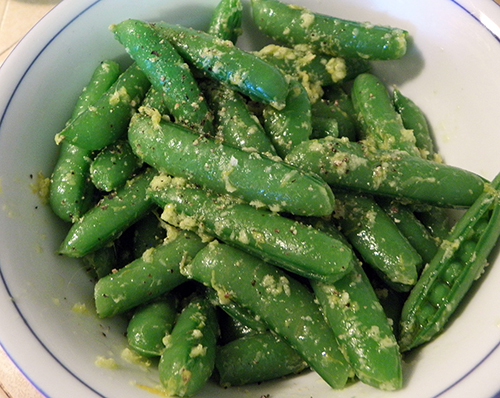 Cook until crisp-tender, stirring around occasionally if peas float to the top, about 2 - 2.5 minutes. Remove quickly with slotted spoon to a medium mixing bowl. 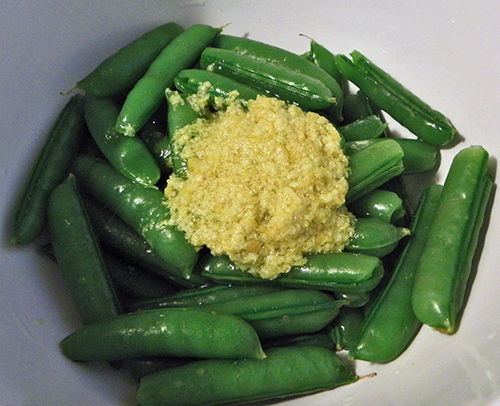 Give the dressing a stir, and pour over the peas. Toss to distribute dressing. 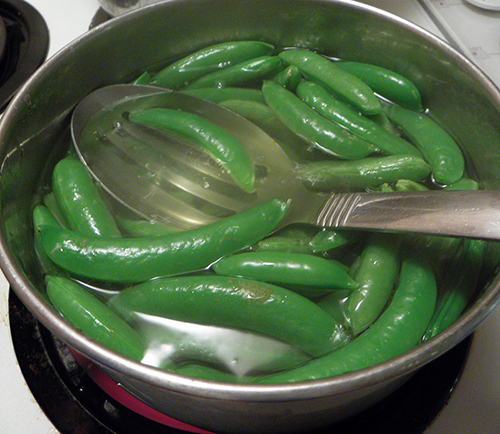 Remove peas to serving dish. Eat hot or cool to room temperature. Serve with salt and pepper at the table. Leftovers—if any—are delicious served chilled.